From the Mediterranean to the Baltic, nationalists in numerous European states are looking to build on the advances they made in 2017. The present surge in nationalism is a threat to the EU itself – but it could have been anticipated, writes Slavenka Drakulić. October 2017. Barcelona, Spain. Catalan pro-independence protests: hundreds of thousands rally in the streets, carrying Catalan flags and banners with the slogan ‘Catalonia Is Not Spain’, and chanting ‘Llibertat!’. 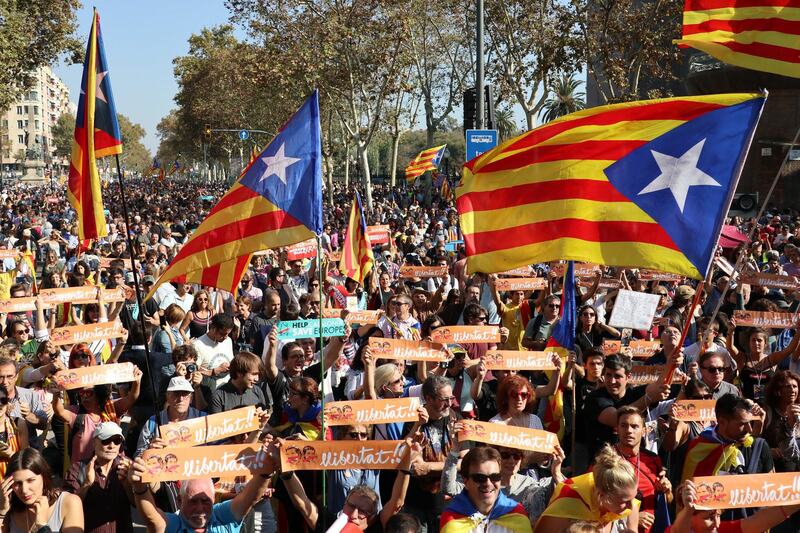 At some points there were as many as 450,000 pro- independence protesters in the streets. 11 November 2017. Independence Day in Warsaw, Poland. The police estimated that 60,000 people marched in the largely young crowd. Many chanted ‘Fatherland’, their banners read: ‘White Europe’, ‘Europe Will Be White’ and ‘Clean Blood’. The Wall Street Journal reported that some of the marchers had flown in from Hungary, Slovakia and Spain, and waved flags and symbols that those countries used during their wartime collaboration with Nazi Germany. Polish state television called the procession a ‘great march of patriots’. These two recent episodes, one illustrating separatism, the other racism, are symbolic of the new forces that have been emerging in the EU over the last couple of years, forces that thrive on fear and call for new walls to be erected, for pure blood, for the exclusion of Others and for division. Patriotism does not demand comparison and conflict. And because it is a private feeling – in the domain of memory, childhood, landscape, food – no justification is needed. The fact that nationalism, by contrast, needs confrontation, and is therefore dangerous, is often neglected. Not so long ago, at the beginning of the nineties, while the rest of Europe was uniting or hoping to unite by joining the EU, one country was falling apart in bloody wars. That country was Yugoslavia – the best-off communist country there had been, and the one least expected to descend into secessionism, separatism, ethnic cleansing, civil war or aggression. The reason it did was nationalism. Today it is more important than ever to understand how nationalism came to play such a decisive role, to the point of a break-up, because it looks as if Yugoslavia managed to export it to the EU, a community built precisely to avoid nationalism and war. A paradox? Yes, to the extent that it was not expected. But now it seems to be the logical consequence of events set in motion after the collapse of communism in 1989. 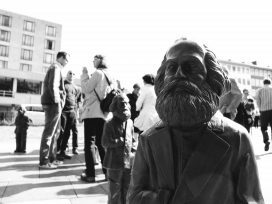 Because soon enough, one could observe a curious phenomenon in the public life of former communist countries: the increasing importance of national identity, along with the growing role of the church and religion in public life. It is as if there were suddenly a need for self-legitimization and self-confirmation, a need to again articulate who you are through language, as in the Baltic countries which have a large Russian minority. Or to rewrite history, as in Croatia, in opposition to the ‘official history’ interpreted by the Communist Party. The quick accession of former Soviet-bloc countries to the EU was meant to overcome differences in history, experience, the economy and culture between eastern and western Europe, not taking into account that there is no such thing as a short-cut to the development of democracy. The psychological shock that millions of citizens must have experienced during the collapse of an all-encompassing political system, and the subsequent transition, was barely taken into account. East Europeans were supposed to rejoice; they did, but it was short-lived. A decade passed and they accused the EU of neocolonialism, exploitation, creating economic injustice; about the lack of jobs and the democratic deficit. In the meantime, they learned the hard way that they are not the same kind of Europeans as those in the West, that some people are more European than others, that living on the periphery and coming from another time simply makes you a second-class European. However, under the communist state’s pressure to comply and conform, nationalism proved to be a vital and positive force, keeping alive national identity, culture, language and religion. Therefore, when many started to perceive globalization as a new threat, even a new kind of totalitarianism, especially in eastern Europe, but also increasingly in the West – the same identity ‘protection mechanism’ was activated again, reverting to what was familiar. Many Europeans developed something akin to what Zygmunt Bauman called ‘Retrotopia’ – the ‘rehabilitation of the tribal model of community’. They turned back to what was before, imagining that past more than really remembering it. Should one call this nostalgia? It is more than that: it is, according to Bauman, a restorative, anti-modern form of nostalgia, a nationalist revival that reached its peak in the Yugoslav wars and currently attracts voters all over Europe and beyond. Frustrations are mounting instead of diminishing. Obviously the way to express them is in the rise of radical right parties and separatist movements. But what energizes them now? What provoked slogans like ‘Clean Blood’, and the growing acceptance of extreme nationalism and xenophobia among young people in Hungary, Slovakia and the Czech Republic? Or in Poland, among Europe’s most prosperous countries, the only member of the EU that, for example, didn’t experience a recession after the financial crisis. There were few economic problems, and even fewer immigrants – but in Poland the government-controlled media broadcast near-nightly reports on crimes committed by Muslims in Europe. Polish historian and former dissident Adam Michnik once said that nationalism is like a virus: it is dormant in every organism and every society but can wake up when the conditions are right. He was speaking about the wars in the former Yugoslavia. But what could be interpreted as the ‘right conditions’ now? Apparently, the powers that be have – again – underestimated the power of emotion. It has become obvious that at the root of nationalist passions is fear: the real or imagined fear that immigrants could change our way of life. If nationalist propaganda manages to create fear in people, then the main step towards conflict is taken, the main obstacle overcome. A feeling of insecurity creates fear of the Other, a closing down, a fencing off of Others and, finally, aggression. Even if nationalism in Yugoslavia thirty years ago did not have the same historical roots as contemporary nationalism in, say, Spain or Italy today, it is scary to see the pattern being repeated. Because the psychological mechanism of using fear to evoke hatred works in the very same way – by employing words. When speaking about the psychological preconditions for the violence and conflicts that nationalism could provoke, the absolute precondition is violence in words, in language itself. If nationalism needs an enemy, it has to be clear who that enemy is. In fact, it has the power to create the enemy by first naming it. Therefore, through the media the nationalist propaganda machine launches the language of division, suspicion and, eventually, hatred. If there was a history of problems between the two sides (as in Catalonia, the Basque Country, Belgium or eastern Ukraine) so much the better, because it could then be used – manipulated to divide people and whip up emotions. For that you need strong language. Every conflict is prepared with the use of dangerous words. We can already hear the same words and vocabulary that were last used decades ago. Interestingly, it seems that problems perceived as real – such as the economic crisis, the loss of faith in compromised politics and politicians, and in the Brussels bureaucracy and European unity, along with the collapse in the social-democratic welfare system and solidarity principle – were less important as a prompt for unleashing the forces of nationalism. The immediate trigger for mass discontent became the influx of immigrants, or rather the political manipulation connected to this. For example, Marine Le Pen’s cry ‘Give us France back’ or the German AfD party’s poster ‘Stop Islamisation’. The examples are many. It is fear of immigrants that connects, say, the separatists of Spain and the Polish right-wing youth, the German AfD and France’s Le Pen, Hungary’s Viktor Orbán and Geert Wilders in the Netherlands, the True Finns and the Sweden Democrats. 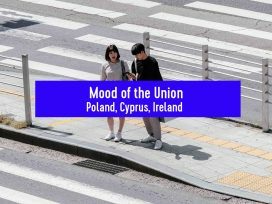 The social atmosphere it cultivates makes possible the articulation of radical demands and the explosion of nativist political movements all over the EU, to the point that the union’s very existence is questioned. 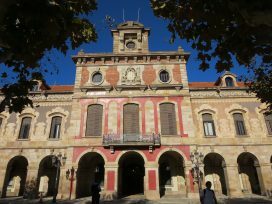 While Catalans are seizing on a moment of general discontent and anxiety, and the influx of immigrants does not seem to be playing a key role in that conflict, it is the response to the presence of immigrants more widely that has enabled a change in the European atmosphere from connivance to the expression of separatism. The fact that, for example, Finland took in just a few immigrants while Sweden accepted 280,000 – the most in the EU, in relative terms – but both are experiencing a resurgence in nationalism, shows that, regardless of the real numbers, people are reacting with fear. In the right-wingers’ language, all immigrants and migrants, besides being criminals and rapists, are Muslims and therefore potential terrorists. This ‘immigrants-equals-Muslims-equals-terrorists’ logic is a clear political use of identity. This kind of language, which reduces nations to a religion (and the religion of the enemy therefore becomes a threat in itself), was exactly the kind of language that laid the ground for the nationalist wars in the former Yugoslavia. Yet no lesson was learned from that. Not even enough to recognize the signs and dangers of nationalism, so as to respond promptly. In the same way, today’s Others – immigrants and refugees – are no longer allowed to be individuals, not even members of a state or a nation. They are reduced to a religious identity, regardless of whether they themselves are religious or not. But what are the differences, if any, between the Catalan separatists and the Lega Nord on the one side, and right-wing movements and parties in Poland, Hungary, the Netherlands, Finland and Germany on the other? Regardless of the historical differences, one can say that they are different in the degree of their desire for separation now. Some are already half-way out of the union, others want to depart, while others want to keep immigrants out and their nation-state ethnically clean. The point is that the politics of exclusion is becoming mainstream, and nationalism and nativism are on the rise. The only visible alliance forming at the moment is the one against the alleged threat of a Muslim overflow. Now Europeans must learn how to live with fear of the future. The European Union is dangerously shaken, and Europeanism – an identity in the making – has acquired a new meaning: building inner and outer, physical and psychological walls against immigrants. It is a self-fulfilling prophecy: the fear of immigrants threatens to destroy the very social and political fabric, culture, tradition, religion and way of life that Europeans want to protect. And thus, as Ivan Krastev writes in his book After Europe,2 immigrants may become the ones who determine the destiny of the EU. A version of this article was first published in German in KULTURAUSTAUSCH 1/2018. George Orwell, ‘Notes on Nationalism’ (essay, written May 1945; first published in Polemic #1, October 1945). Ivan Krastev, After Europe (2017, University of Pennsylvania Press).